We help make hospitalization a more positive experience through play, preparation, music and creative arts. Child life promotes coping through various interventions to help children, youth and families cope with stressful events. Providing play and other normalizing activities can help with this coping process. Child life programs endeavour to meet each family’s unique emotional and social needs. 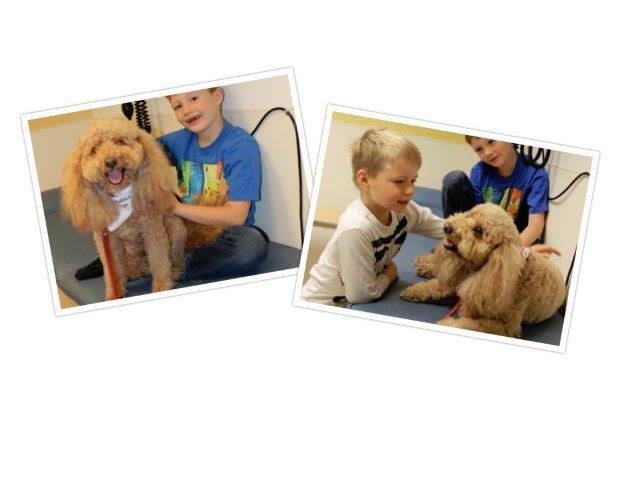 *Two of our most popular programs are the Therapeutic Clown Program and the Dog Visitation Program. A therapeutic hospital clown is a professional entertainer who has been thoroughly trained in the specifics of working in a hospital environment – physical hygiene, emotional hygiene, infection control, confidentiality and professional etiquette. The therapeutic clown works on a regular basis (for example, once a week) and is directly responsible to the Child Life Department. The clown is fully briefed by the child life specialists before engaging with the patients, and understands that the wishes and needs of the child takes priority over those of the clown. “Ms. Phizzio Fit – Frizzio Therapist” or “Fizzie” as many of the children fondly refer to her, began at Children’s in 2004. In 2013, we saw the addition of a second therapeutic clown, “Cosmo.” “Fizzie” and “Cosmo” come into the hospital weekly to spend time with inpatients. They also visit outpatient clinics. For more information, refer to the Canadian Association of Therapeutic Clowns website. Please contact Lisa Knight for more information about the Dog Visitation Program and see "Volunteering with us" for information on becoming a therapeutic dog volunteer. For further information about the professional requirements of becoming a child life specialist please see The Association of Child Life Professionals. Volunteers and students are an integral part of child life service. If you would like to volunteer, see Volunteer with Us. 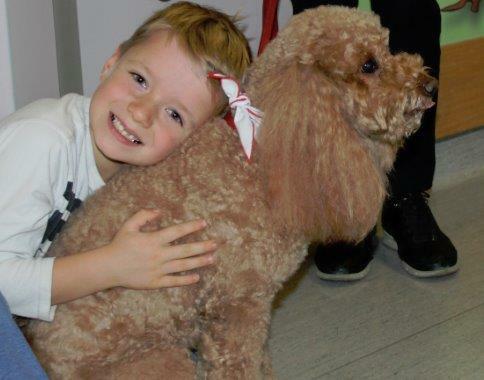 BC Children's Hospital is excited to offer therapeutic dog volunteers. The hospital partners with St. John's Ambulance to train and screen our therapeutic dog volunteers. If you are interested in committing to a weekly shift, please see these requirements and find the online form. Make sure to indicate "Therapy Dog Volunteer at BC Children's Hospital" in the "Area of Interest" field. If you would like a list of toys, games and other items the Child Life Department needs in their play areas and units, please see our wishlist. You are also able to give online through our hospital foundation. For all non-monetary donations, please contact Patient Experience. Due to infection control guidelines, we regret that we cannot accept any used toys or books for patient care areas. The Sunny Bear Birthday Club helps your child donate any funds raised from birthdays to the patients and families of the hospital. Thank you to our donors. Without you, we wouldn't be able to do what we do. We believe children and youth need to understand what is happening to them. A child life specialist can help children and youth understand their experiences and feelings through play, education and support. Check out BC Children's Surgery page for more helpful information before coming for surgery. We understand that a blood test can be very anxiety inducing for a child, and it can be difficult to remain still when feeling anxious. To ensure that your child has a successful, but positive experience, we would like to share comfort positions that can be done during a blood test or immunization. If you feel that your child would benefit from extra support with getting bloodwork, please contact Lisa Knight or Jannie Ngo to book a child life specialist to work with your child at BC Children's Hospital. The child life department offers opportunities for children and youth to prepare for a non-sedated MRI with an MRI simulator. Please contact MRI Simulator for more information. Every person with autism is unique. Please complete an Autism Assessment Form to help us better understand your child's needs, and send it to the child life specialist in your area. These positions are designed to ensure that your child is able to experience a successful IV start, without involving forceful restraint. Please see the list below for our current team of Child Life Specialists within each area of the hospital. ?Please mention child life to your health care professional to get a referral process started.